The Hobo Museum was one of the middle stops on our record-breaking marathon day of roadside attraction visits. 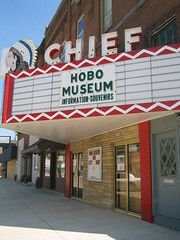 It is housed in a former movie theatre in the town of Britt, Iowa (though funds are being raised for a new museum). In the musty, dimly lit, hollowed out theatre are rows of glass cabinets, shelves, and bulletin boards housing Hobo keepsakes as well as a short video. So what's a Hobo?? 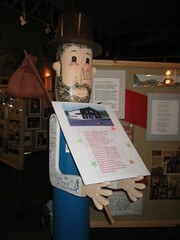 The keepsakes and photos in the museum make Hobo living look attractive and peaceful. Traveling to make money to continue traveling. No house to worry about. A simple life with good friends and lots of adventure. Hmmm, as attractive as that seems, I think I'll keep being a Roadchick.